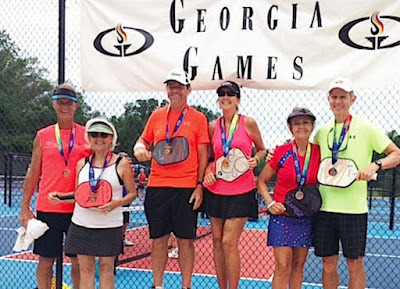 The game of pickleball has been around for more than 50 years and is a wooden racquet sport that is similar to tennis, badminton and table tennis. It was started by accident when Washington State politician Joel Pritchard invented the game as a way to give his children something to do. He lowered a badminton net and, instead of using a shuttlecock to hit the ball, they used a whiffle ball. What started out as a game for children has grown into a sport for adults. It’s growing in popularity among some residents of Coweta County. Last weekend, several local players participated in the annual Georgia State Games at Tyrus Park in Griffin.